The Falcons went to a place on Sunday that hasn’t been kind to them in the last few years, and that was the Superdome to face the New Orleans Saints. This was a huge game for both teams as they were looking to keep their playoff hopes alive. But as much as the Falcons struggled in the Superdome the last three years, it was not the case on Sunday as they took it to the Saints 30-14. It didn’t look like the Falcons were going to win as the game began. On the opening kickoff, Jalen Saunders returned a kickoff for 99 yards and Mark Ingram scored on the first play from scrimmage for the Saints to take the lead. But it was all Falcons after that. On the ensuing series, Matt Bryant kicked a 44-yard field goal to cut the Saints lead. The Falcons cut the lead to one when Bryant kicked 50-yard field goal early in the second quarter. But the series of the game came and the end of the second quarter when the Falcons put together 12-play, 89-yard drive that lasted over five minutes. The series ended when Matt Ryan threw a 3-yard touchdown pass to Eric Weems to take the lead. The Falcons did not let up in the third quarter either. 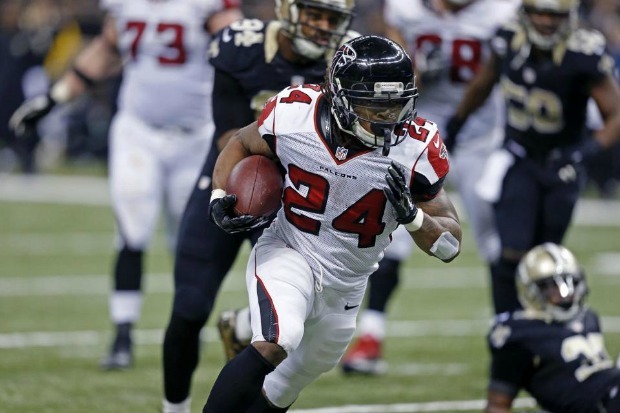 They added seven points early in the third when Devonta Freeman scored on a 31-yard run to go up by 13. The Saints were able to cut the lead to six early in the fourth quarter when Drew Brees threw a 4-yard touchdown pass to Jimmy Graham to cut the lead to six. The Falcons could not add to their lead on the ensuing drive and had to punt it away. However, Brees threw an interception to Robert McClain with 2:40 left in the fourth, and that led to a Bryant 32-yard field goal to seal the fate of the Saints. However, the Falcons put one last score on the board as Kroy Biermann sacked Brees, forced the fumble and is returned by Osi Umenyiora for an 86-yard score. The story of the game was the play of the Falcons defense. The unit only allowed 328 yards, forced four turnovers and sacked Brees five times. One of the players stood out was Dwight Lowery who forced a fumble and got a sack on Brees to go along with his five tackles. As for the offense, Ryan was efficient, going 30-of-40 for 322 yards and one touchdown. Julio Jones was back in the lineup after missing the Pittsburgh game last week and caught seven passes for 107 yards. Freeman ended his day with 36 yards on five carries and one score, and he did a good job filling in for Steven Jackson who left the game with a quad injury. With the win, the Falcons improve to 6-9 and have eliminated the Saints from playoff contention. The only way the Falcons can make the playoffs is winning the NFC South. They will host the Carolina Panthers next Sunday and the winner will take the division and host a first round playoff game.